Nick works out of a spacious well equipped home-based shop in Glade BC, which also housed the initial activities of the USCC Kootenay Men's Group until their relocation to their modern shop in Brilliant. More a life-long passion than a simple hobby, Nick Denisoff's woodcraft has largely been inspired by traditional Doukhobor woodworking procedures and motifs. He has made numerous spinning wheels, hundreds of spoons and ladles and various kinds of furniture often incorporating traditional designs. He also enjoys teaching and demonstrating woodcrafting skills to others. Harry Hadikin takes pride in his work as a hobby craftsman, continuing the traditions of his Doukhobor ancestors by bringing beautiful, handcrafted woodwork to homes in the Slocan Valley for the past 30 years. 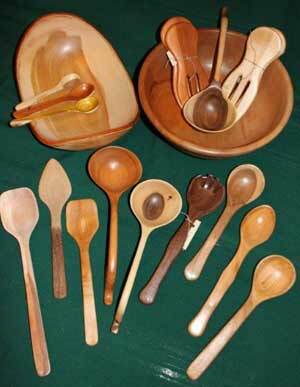 Items such as authentic hand-made hardwood ladles, salt bowls and everything from baby spoons up to cooking and serving spoons, salad sets, bowls, kitchen utensils and bird feeders are what Harry loves to create. He takes a no-waste policy to his workbench, making as many items as possible out of a single piece of wood. 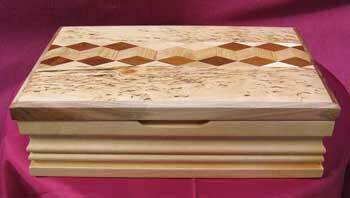 His products are made from a variety of woods including maple, birch, local softwoods, and several fruit and flowering trees such as peach, walnut and lilac. 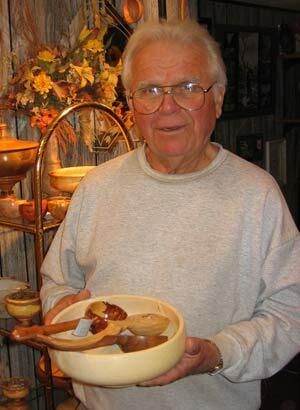 Harry's work can be found on display at the Deadwood cafe in Greenwood, as well as at local Christmas craft fairs. However, he primarily sells his work through custom orders. Featuring local and imported exotic woods. A founding member of the USCC Kootenay Men's Group, Walter has been crafting utilitarian and ornamental wood pieces for more than 30 years. 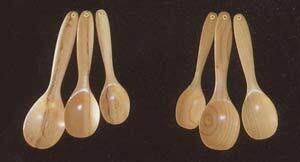 His woodcraft is often characterized by the vibrant colours and flamboyant patterns of its woodgrain. His pieces have been presented as gifts to visiting dignitaries and have been regularly featured in the local Annual Castlegar Artwalk. 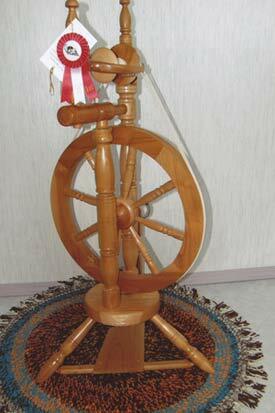 Also look for Walter's woodcraft at local festivals and craft fairs. Now retired, Paul continues his woodwork, sharing his home-based workspace with his wife, Lorraine. You can contact them regarding their craftwork at their home. Paul has been an active participant in the activities and culture of the Grand Forks Doukhobor community since his youth. Confronted with his beloved rural life-style and culture in apparent decline, he amassed a collection of old farm machinery, various tools and household objects and cleverly integrated them into his beautifully landscaped back yard garden. In time this collection became known as the "Pioneer Garden", a respectable museum of sorts, which was opened to the public and became a frequent destination for busloads of tourists and a venue for local weddings and photo shoots. Paul had also by that time become a skilled woodcrafter, repairing and constructing spinning wheels and furniture, and carving wooden bowls, ladles and spoons, offering his products for sale to touring visitors. His woodwork has now found its way into souvenir collections around the globe, and has been gifted to important dignitaries, including Mikhail Gorbachev and President Bill Clinton. Click to view photos of Paul's woodwork on our website.